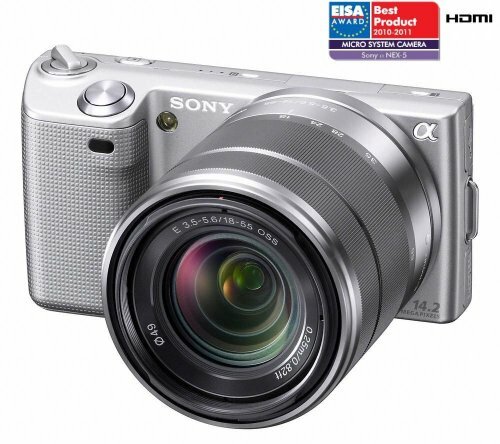 Claimed to be one of the world’s smallest and lightest interchangeable-lens cameras, the Sony NEX-5K is supplied here with a 18-55 mm stabilised lens to enable you to capture the world around you, wherever you go, with a wide viewing angle. The 14.2-megapixel CMOS sensor on this camera is the same size as the one built into Sony’s full-sized SLR cameras. It really makes the difference when it comes to taking photos. Sensitivity on the NEX-5K reaches ISO 12,800, so you’re guaranteed clear, pin-sharp pictures even in low lighting conditions. The NEX-5K’s 3-inch LCD display tilts down 45 degrees and up 80 degrees for high- and low-angle shots that would otherwise be hit or miss. The manual focus ring can be used to magnify the image you see through the viewfinder, great for those who don’t like to let details slip. And the Sony NEX-5K is also equipped with six creative style settings for adding finishing touches. There’s even a sweep panorama mode and an HD video feature where you can shoot footage with resolutions of 1920 x 1080 pixels. An HDMi socket is available too.